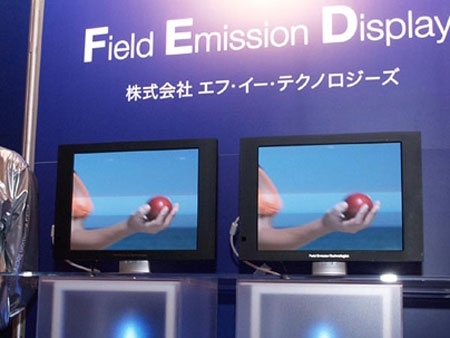 FED (Field Emission Display) technology is similar to its cousin: SED. They both produce images using millions of electron emitters that are located only millimeters from a phosphorus coated screen. They also both produce images, color and light when electrons collide with the phosphorus coated screen. The differences between SED and FED HDTVs is how the electron emitters work. SED electron emitters use an extremely narrow slit several nanometers wide to help guide the electrons to the correct area of the screen. To get around SED’s patents, FED manufactures are using other methods such as carbon nanotubes to correctly direct the electrons. Likely will never happen. The technology has been sold to AU Optronics Corperation and it is unknown if they will mass produce FED HDTVs.